The Council for Accreditation of Educator Preparation (CAEP) is the accrediting organization for US schools, colleges/universities and departments of education. Missouri Department of Elementary and Secondary Education (DESE) 2017 Annual Performance Reports for Educator Preparation Programs. This site provides Pass Rate Data for the all Educator Preparation Programs. For Harris-Stowe State University College of Education Teacher Candidate Pass Rate Data information visit the website listed below. > Once you click on the website below, select the year (2017), then select the value: Harris-Stowe State University. Please click here to access the Missouri Department of Elementary and Secondary Education (DESE) 2017 Annual Performance Report for Educator Preparation Programs. The Title II Report is a Federal Government report available to the consumer who is interested in the performance of state teacher education programs. 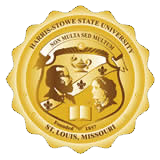 Please click here to access the Title II Report, Section V. Traditional Summary Pass Rates for Harris-Stowe State University . > The Harris-Stowe Fact Book, trends in enrollment, degrees awarded and graduation rates may be found here. Please click here for Harris-Stowe's Institutional Report.